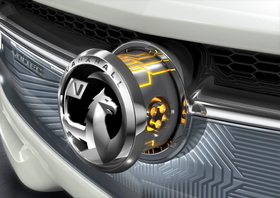 Opel/Vauxhall released this teaser photo to raise interest in its next low-CO2 car. MUNICH -- General Motors Co.'s European unit Opel will unveil a futuristic concept that it says will demonstrate the company’s push to be a leader of environmentally responsible motoring. Opel did not give any more details of the concept, but it has hinted that it could be an extended range electric car like the Ampera, which launches in Europe late next year. The Ampera is Opel's version of the Chevrolet Volt. Opel said the Geneva concept will be "proof that size and comfort do not need to be sacrificed for a vehicle to be environmentally efficient."